Dionaea muscipula ‘Farou’ has different shades of pale green, however, the digestive glands are reddish as in the wild type (Fig. 1). The petioles are long and elongated. The traps remain small. The trap margins are thinner and darker green than the trap interior. The teeth along the trap margins are comparatively short and slightly inflexed, those near the trap apex and base being shorter than those at half length of either margin. Each trap has 4 transparent trigger hairs (instead of 6 in the wild type). 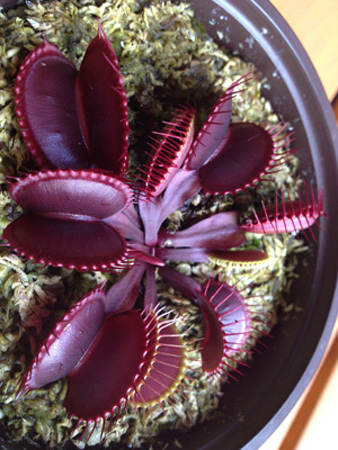 I named Dionaea muscipula ‘Farou’ after my dog in April 2014. To maintain the unique features of this cultivar it should be reproduced by vegetative means only. 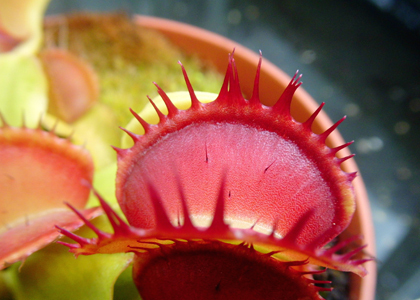 Figure 1: Dionaea muscipula ‘Farou’ plant and trap showing four transparent trigger hairs. 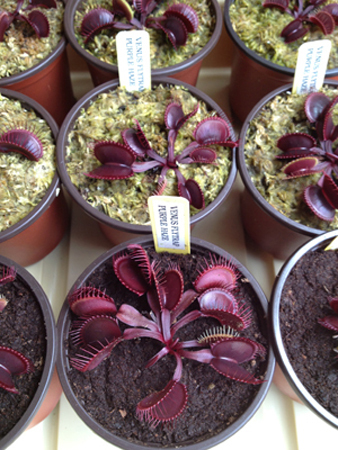 I discovered Dionaea muscipula ‘Carniplant’ in February 2014 in my greenhouse, being part of an order from a Holland producer. After 9 months in cultivation, new plant leaves maintain the same characteristics and are considered stable. The marginal teeth are fused in a few groupings, and some of them can be crossed (Fig. 2). The first traps of the growing season may have 3 trigger hairs per lobe, but eventually producing 4-5 functional trigger hairs per lobe; a total of 8-10 for each trap. The most similar cultivar is probably Dionaea ‘Triton’, but this can be distinguished easily by its fused distal ends of the traps. 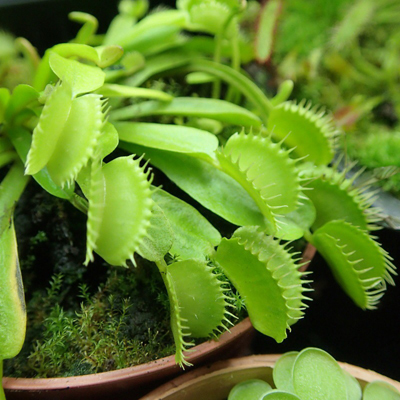 Dionaea ‘Carniplant’ differs from Dionaea ‘JA1’ in the number of trigger hairs (6 in Dionaea ‘JA1’ and 8-10 in Dionaea ‘Carniplant’) and trap color when grown in direct sunlight (Dionaea ‘JA1’ is mostly green and Dionaea ‘Carniplant’ turns red). 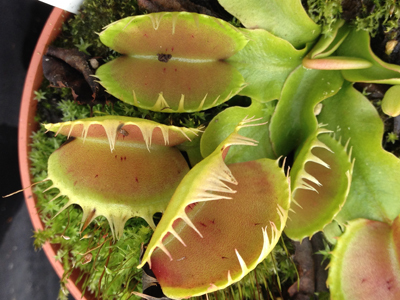 The plant also differs from Dionaea ‘Fused Tooth’ in that in Dionaea ‘Carniplant’, not all of the marginal teeth are fused (Fig. 2), has larger petioles, and a higher number of trigger hairs per lobe. I have introduced leaf cuttings in tissue culture to propagate the cultivar and maintain the unique features. Figure 2: Dionaea muscipula ‘Carniplant’. Dionaea muscipula ‘Purple Haze’ (Fig. 3 and Front Cover) is a unique cultivar I developed by transferring the pollen from the anthers of a Dionaea ‘Low Giant’ to the stamens of a Dionaea ‘Akai Ryu’ on 4 May 2005, resulting in the production of 37 seeds that were immediately harvested and planted on 23 June 2005. A total of 29 seeds germinated and were allowed to grow for five months. During that time, I observed one unique seedling exhibit traits that were different from the other seedlings, specifically, darkest color and largest trap size. I named this young Dionaea ‘Purple Haze’. Dionaea ‘Purple Haze’ grows leaves horizontally and low to the ground throughout the growing season. A mature plant has never displayed a leaf base longer than the length of its trap. More specifically, this plant maintains a unique leaf base to trap length ratio of approximately 1:1 in the first three years of growth, followed by a ratio of 0.7:1 as the plant matures. A fully mature six-year-old plant will develop stout robust marginal lashes with a leaf base never exceeding 2.75 cm long and a trap size length range of 3-4 cm. The entire plant of D. ‘Purple Haze’ exhibits a deep purplish red color (RHS 71A) when grown in 8 hours or more of direct sunlight. This also includes the flower stalk and sepals. A very limited amount of a green/yellow coloration band is present on the trap’s outer edge only during the early stages of trap development and again as the plant prepares to enter winter dormancy. Otherwise, D. ‘Purple Haze’ maintains a uniform deep purple color throughout the entire growing period. Figure 3 (right) shows plants from leaf pullings in their third season of growth. 1) Color – Deep Purple Red (RHS 71A) covers entire plant throughout the growing season. 2) Growth pattern – Always grows leaves horizontally and low to the ground, never erect. 3) Leaf base length – Never exceeds 2.75 cm even on fully mature plants. 4) Trap length – Averages 3 to 4 cm on mature plant. 5) Leaf base length to trap length ratio – Leaf base length never exceeds its trap length. 6) Trap marginal lashes – Normal length but more robust and a little thicker at base of lash. • ‘Bohemian Garnet’ comes close to ‘Purple Haze’ in #1 (Color) and passes #2 (Growth pattern), but fails #6 (Marginal lashes) due to sawtooth. • ‘DC All Red’ fails #3 (Leaf base length) and also #5 (Leaf base length to trap length ratio). Also maximum leaf size is stated to be 12.5 cm with traps 3 to 3.5 cm which also supports the failure of #3 and #5. • ‘Petite Dragon’ fails #4 (trap length) as implied by the name, ‘Petite’. • ‘Red Burgundy’ fails #2 due to erect summer leaves and fails #3 and #5 with leaf bases that can reach up to 10 cm in length. • ‘Red Pluto’ fails #1 since the color is listed as reddish brown and also fails #3 and #5 since leaf base can reach a length of 5 cm along with a trap length of 3.2 cm. Traps also develop a mutative form where the distal ends are partly fused. Although Dionaea ‘Purple Haze’ is capable of producing a fair amount of seeds by sexual reproductive means through self-pollination, this method does not guarantee that all unique features identifying the cultivar shall be faithfully reproduced. This cultivar must be reproduced vegetatively by rhizome cutting or leaf pulling in order to assure retention of all unique characteristic traits. ‘Purple Haze’ is a song written and recorded by the late legendary rock star Jimi Hendrix and inspired the cultivar’s name, due to the vivid purple hue of the traps when illuminated by the early morning sunlight. 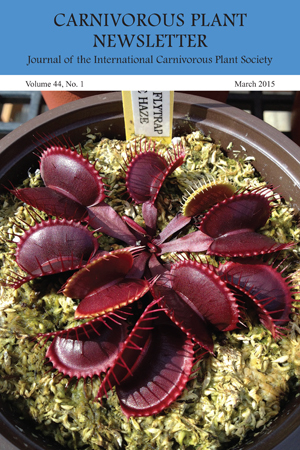 Front Cover: Dionaea muscipula ‘Purple Haze’. Photo by John M. Kotleba. Sarracenia ‘Legacy’ is a cross of S. ‘Leah Wilkerson’ × S. ‘Adrian Slack’ produced by Brooks Garcia in 2008, which I grew out from seed. Out of a very small handful of seeds that Brooks sent to me that year, I was only able to germinate two seedlings. Sarracenia ‘Legacy’ was the only plant to survive and grow from that particular batch. I coined the name Sarracenia ‘Legacy’ in 2012. The word “legacy” refers to a gift, or something of value passed on from one generation to another. The name is derived from a combination of factors. Sarracenia ‘Legacy’ commemorates the individuals the parent plants are named after, as well as their work with the furtherance and cultivation of this majestic genus. “Legacy” also pays homage to the influence that the parent plants have, and will continue to have on Sarracenia cultivation for generations to come. On a more personal note, the name also pays tribute to those who have inspired me in my botanical endeavors. I am deeply thankful for the botanical passion, vision, and drive that has been passed into my life by so many wonderful individuals. 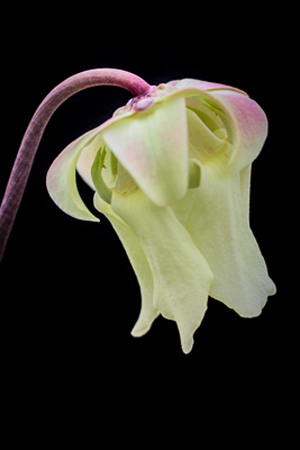 Young pitchers start off predominantly greenish, with traces of white in the upper portion. As pitchers mature under intense light, the white top portion of the pitcher intensifies and spreads, and a strong prominent dark red splotch develops in the throat (Fig. 4 and Back Cover). 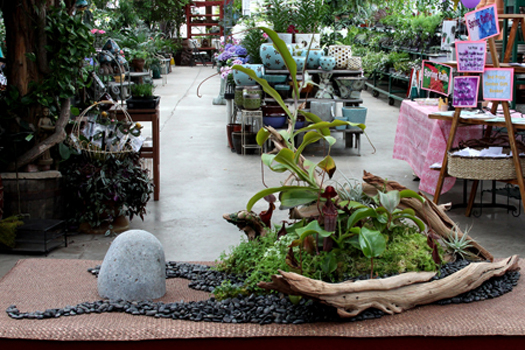 These features have been stable in both outdoor and greenhouse conditions. 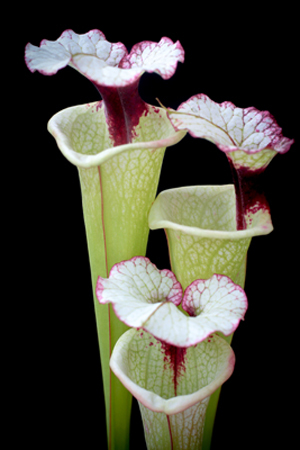 The pitchers of Sarracenia ‘Legacy’ typically attain a height of 60-75 cm however larger pitchers have been observed. Blooms are yellowish-cream with light hints of pink on the sepals (Fig. 4). This plant should be reproduced only by vegetative means to ensure that its unique characteristics are maintained. 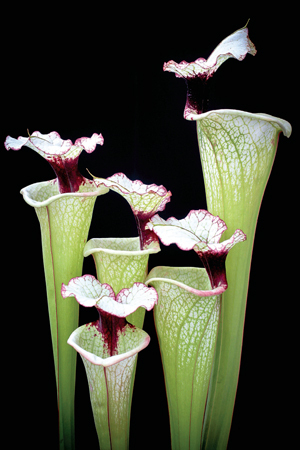 Figure 4: Sarracenia ‘Legacy’ pitchers and flower. Back Cover: Sarracenia ‘Legacy’. 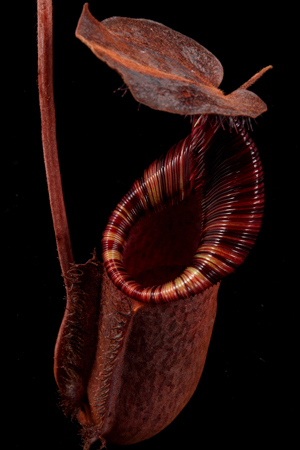 Photo by Robert Co.
Nepenthes ‘H.R. Giger’ (Fig. 5) is a fantastic specimen of the hybrid N. lowii × spectabilis that was produced by Geoff and Andrea Mansell of Exotica Plants, Australia, and purchased as a small plant in 2010 from Tony Paroubek at Exotic Plants Plus, USA. The hybrid parentage of N. ‘H.R. Giger’ gives this cultivar a strong blending of the characteristics of both of the parents. The pitcher mouth is not as exaggeratedly open and wide as that of N. lowii, but it is more so than N. spectabilis. The pitcher body is elongated and tubular, yet not straight-bodied as that of N. spectabilis with some hints of the contorted features of N. lowii as well as its woody texture. 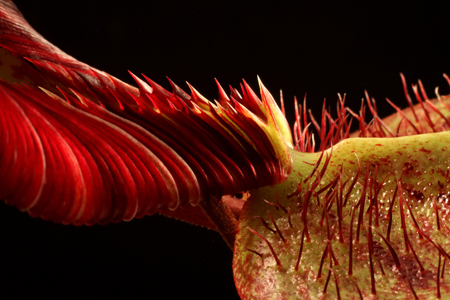 The striping on the peristome goes from yellow through various degrees of red and the pitcher coloration is deeply speckled with dark chocolate-like colors against a red background from exposure to high levels of lighting for the lower pitchers, while the upper pitchers are still quite deeply colored and retain the great peristome striping. Both the lower and the upper pitchers exhibit large amounts of spikes under the pitcher lids with the lower pitchers having prominent frontal “wings” on their bodies which act as ladders for crawling insects, where the upper pitchers do not exhibit these “wings”. What distinguishes N. ‘H.R. Giger’ are the flared peristome of the pitcher mouth akin to the N. spectabilis parent, the exhibiting of large peristome teeth, and the numerous hairy spikes under the pitcher lid akin to the N. lowii parent (Figs. 5 & 6). 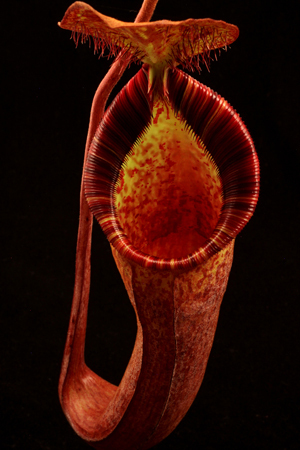 The unusually numerous lid spikes, somewhat contorted body and deep coloration even on the upper pitchers, are all distinguishing characteristics that make this individual an outstanding example of the N. lowii × spectabilis hybrid. Also, the plant grows large like N. lowii, and readily vines like N. spectabilis, and produces pitchers rather frequently, making it a rewarding specimen for cultivation (Fig. 7). It can grow well in somewhat warm temperatures, but exhibits the best characteristics in cooler temperatures due to the N. lowii parentage. The plant has flowered and is a male. I named this plant Nepenthes ‘H.R. Giger’ in October 2014 in memory of the recently passed Surrealist Artist from Switzerland who is perhaps best-known for creating the Alien creature for director Ridley Scott’s 1979 film “Alien”, which earned him an Academy Award for the Best Achievement in Visual Effects for his designs of the film’s title character, the stages of its lifecycle, and the film’s extraterrestrial environments. As the innovator of the nightmarish “Biomechanical” style, he had a long and well-respected career as a globally influential fine artist in the disciplines of painting, sculpture, industrial design, and interior design. 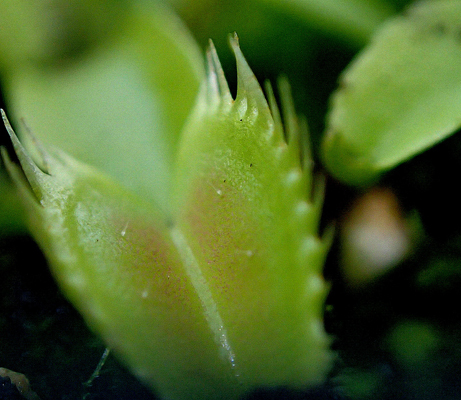 When viewed extremely close and at an angle, the intersection of the peristome teeth and the lid spikes of the cultivar create a frightening alien landscape akin to those imagined by the late H.R. Giger (Fig. 6). This, and because the plant is darkly colored and has such a nightmarish appearance, I feel that it would be a fitting tribute to name the cultivar for the late visionary genius Hans Ruedi Giger. Figure 5: Nepenthes ‘H.R. Giger’ upper (left) and lower (right) pitchers. Figure 6: Nepenthes ‘H.R. Giger’ peristome teeth. 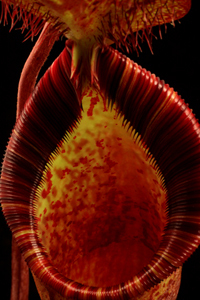 Figure 7: Nepenthes ‘H.R. Giger’ is a nice specimen in cultivation.